Happy New Year, art lovers! 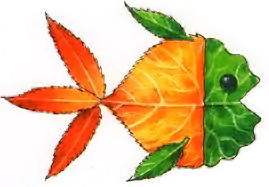 Let’s begin our new year with something interesting like leaf art. Bright painting ideas turn ordinary fall leaves into amazing artwork, unique gifts and home decorations. Creative painting ideas add color and interesting design to real leaves, offering beautiful art-and-crafts ideas for children and adults. Leaf painting ideas came from ancient China, where artists practiced the technique centuries ago. Fresh leaves or dry fall leaves are an excellent canvas for creating fall art masterpieces. Artists throughout the world create paintings on sturdy leaves, including sycamore or peepal leaves that are common canvases for painting leaves. Unusual leaf shapes and interesting or colorful painting ideas make leaves look beautiful and original. Simple designs and bright paint colors are great for kids’ art projects. Children can paint on fresh or fall leaves and keep their art works for years. Painting on peepal leaves is a delicate art form that originated in southern India (Kerala). 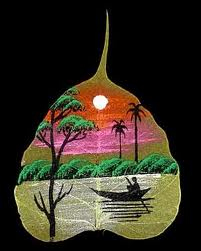 One of the oldest forms of art, it’s done on dry peepal leaves and shows the ingeniousness and patience of the artists. The art form originated because the leaves of the peepal tree have a beautiful shape that tapers to a needle point. Peepal leaf painting is great for making cards, wall decorations, bookmarks, gifts and more. Typically themes painted on peepal leaves include religious Indian figures, animals, scenery. Modern abstract art themes can be experiment with as well. Painting on leaves is very inexpensive. All you need is peepal or any other leaves, oil or acrylic paints and small thin brushes, and a sheet for the background. The painting method is a two-part process: drying the leaves, and painting on the leaves. To dry leaves, place a few in a bowl of water for 15 days to a month. Check the bowl once every few days to see the condition of the leaves. The purpose of soaking is to remove the outer layer of the leaves. After being in water for long, the leaves get a film over them, which needs to cleaned off by washing or using a brush periodically. The water should be changed periodically. Once the outer skin is lost, a beautiful bony structure, usually off-white in color, is left behind. Dry it for a day and the leaf is ready to paint. Use oil or acrylic paints to paint your favorite design on the leaves. Put a colored sheet for background, using a color that will enhance the effect of the painting. Some background is usually kept because peepal leaves are very fragile and may rupture. • Cover leaves with a with transparent sheet to protect the work. Shyama’s Art is having an art exhibition “SQUARE ART 2015” all this month at Carrollwood Cultural Center. A reception and awards ceremony will be 2 to 5 p.m. on Jan. 24, 2015. This is my personal invitation to all those who are interested in the arts. It’s free, so come and enjoy the art because it is done by heart. Remember: When it’s from the HEART, it’s ART. Shyama’s Art Gallery & Studio is at Shyama's Art Studio- 10329 Cross Creek Blvd, Suite L, Tampa, FL 33647. For information, call (813) 843-6784 or visit www.shyamshyama.com. Guru-Shishya Parampara or the guru-disciple tradition has been a pivotal part of intellectual pursuit in almost every aspect of Indian culture and field of learning. This revered tradition existed as far back as recorded history can place it, which is at least for about 5,000 years in the great subcontinent of India or Bharatvarsha. This time-honored Guru-Shahya Parampara is integral to Indian classical music in particular. Our Vedas, Shastras and Upanishads – Hindu religious texts and treatises of philosophy, spirituality and wisdom have been passed on orally from generation to generation, from gurus to students, from parents to children for thousands of years. This recitation or chanting was and still is melodious, harmonious and musical. Indian classical music as we know it originated in Vedic times through spiritual hymns and compositions in Sanskrit – the language referred to as God's own tongue. Sanskrit is in fact the mother of all Indo-European languages and also the origin of all of India's myriad sophisticated languages and dialects. Even Indian mythological gods, goddesses and celestial beings have been generously assigned supreme musical abilities of voice and instruments. Music has an elevated status in all of creation and evolutionary science. These concepts and beliefs are inseparably interwoven within Hindu religious philosophy and spirituality. Lord Brahma, the cosmic creator, is considered the highest guru of gurus. Brahma and his consort goddess Saraswati are both denoted as playing the veena (ancient string instrument). Music, be it in nature or one conceived by human beings, is much celebrated in Indian culture. Our music is universally recognized to have immense depth, complexity, beauty, power as also mesmerizing allure. Thus, the individual who imparts this priceless musical knowledge, i.e., the guru is highly respected, even worshipped. Hindu scriptures have many quotes to illustrate the divinity and prime position that the guru occupies in our lives: the shloka (hymn) “Gurur Brahma Gurur Vishnu” equates the guru with God and pays eternal homage. In ancient and medieval times, the Shishyas or disciples lived with their gurus and were totally tireless in their devotion and service to their teachers. The gurus on their part were equally selfless and generous in imparting their precious musical knowledge to deserving, dedicated and persevering students. Classical music needed (and still does) many years of rigorous training and practice. Musical skill both vocal and instrumental was honed through vibrant public performances, with the guru’s permission and blessings of course. This great Guru-Shishya Parampara has been central to the survival and pristine preservation of Indian classical music far into the 21st century. There are exemplary gurus recorded over the ages like Swami Haridas, who nurtured the ‘Emperor’ of Hindustani music Mian Tansen and the legendary Baiju. Poet-saints such as Basavanna, Akka Mahadevi, Meerabai, Kabir, Tulsidas, Purandara Dasa, Jayadev and others were indeed gurus with astute musical pedigree. The 20th century has witnessed stalwart Guru-Shishya combinations, some of which are listed here. Guru Pandit Vishnu Digambar Paluskar – Shishyas Pandit Dattatreya Vishnu Paluskar, Pandit Omkarnath Thakur… (Gwalior Gharana or school of music). Guru Ustad Abdul Karim Khan – Shishya Pandit Sawai Ghandarva (Kirana Gharana). Guru Pandit Sawai Ghandharva – Shishyas Pandita Gangubai Hangal, Pandit Bhimsen Joshi. Guru Ustad Allauddin Khan (string/reed instruments like been, sarod, shahnai) of the Maihar Gharana – disciples Pandit Ravi Shankar (sitar), Pandita Annapoorna Devi (surbahar) and Ustad Ali Akbar Khan (sarod). Guru Pandit Ravi Shankar and his hundreds of students worldwide. Guru Pandit Panchakshara Gavai (harmonium, vocal) – Shishyas Pandit Puttaraja Gavai, Pandit Seshadri Gavai and countless others in our contemporary musical arena. To conclude, I would like to mention the meaningful lyrics from a beautiful Raaga Bhairavi composition popularized by guru and vocal maestro Pandit Jasraj: “Guru Aagnya Mein Nis Din Rahiye….” Serve under the guidance of the guru, do exactly as your guru wishes. Guru’s glory is boundless, guru’s greatness traverses the divine akshar (letter) ‘Om.’ Prostrate at the feet of the guru and thou shall navigate this worldly existence without obstacles.